Weighty Matters: Subway's Jared Celebrates 10 Years of Weight Maintenance! 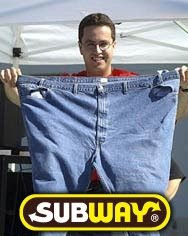 Subway's Jared Celebrates 10 Years of Weight Maintenance! Congratulations go out to Subway's Jared for doing what the vast majority of those that lose weight don't do - keep it off. According to an article in the Washington Post, Jared's Subway eureka moment came back when he weighed 425lbs and his college roommate at Indiana University made a tape recording of the sounds he made while sleeping (severe sleep apnea can sound quite dramatic and frightening). He reports trying a few other efforts before finally settling in on his now famous Subway diet which arose with him reading a nutrition facts panel while standing in line for a sub. The rest of course, is marketing history. Jared's Subway diet amounted to roughly 1,500 Calories a day, low for the majority of men, combined with lots of walking. Subway took notice after Jared was featured on multiple local media outlets and he has remained a spokesman for them every since. He no longer formally counts Calories but certainly practices Calorie awareness and knows what portions work best in his own personal foodscape. Jared's not alone in his weight maintenance success. The National Weight Control Registry (NWCR) now numbers well into the thousands and to be a registrant you've had to have lost over 30lbs and kept it off for over 1 year. The last time I saw Dr. Rena Wing (one of the registry's founders) speak, the average registrant had lost 66lbs and kept it off for 5.5 years. "Therefore if you don't like the life you're living while you're losing, you're much more likely to gain it back"
Jared has kept his weight off because he likes his new lifestyle.